Set to be the native "frontman" for Rome's intended reconstitution of an Irish church plunged into epic straits, at Roman Noon the Pope named Msgr Eamon Martin as coadjutor-archbishop of Armagh, placing the 51 year-old administrator of Derry in line for the chair that, according to legend, was first held by St Patrick around the year 445. In the post, the archbishop-elect will soon succeed the embattled Cardinal Sean Brady, 73, as head of the 230,000-member diocese in the North and, further beyond, as Primate of All Ireland, the traditional distinction reserved to Armagh given its lineage. 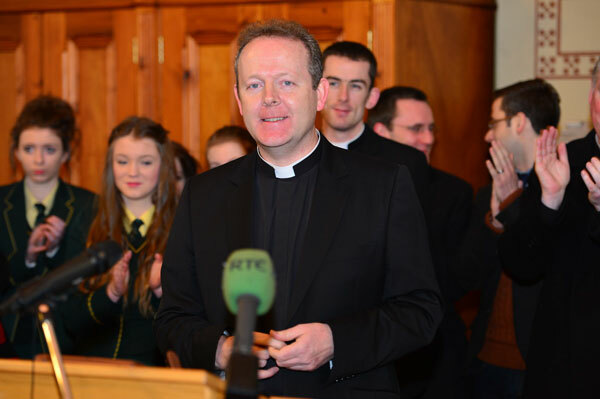 As a more modern sign of his clout, the Primate – almost invariably the holder of Ireland's seat in the College of Cardinals for the last century and a half – serves ex officio as president of the Isle's joint episcopal conference, whose operations Eamon Martin oversaw as general secretary from 2008 until returning to his home-diocese in 2010 as vicar-general. A mathematician and teacher by training said to have a "keen interest" in sacred music, the Primate-in-waiting was elected Derry's administrator on Bishop Seamus Hegarty's early retirement a year later for reasons of health. Equal to Armagh in size, the Derry church remains one of five Irish sees awaiting new bishops; as of today, two of the 26 dioceses stand vacant, with another three bishops serving well past the retirement age of 75. After a years-long drought of appointments from Rome, two other dioceses have been filled since late November, and the widespread thought remains that the sprawling structure – which, in reality, oversees fewer Catholics than live in New York City or Los Angeles – is in for a significant consolidation over the coming years, especially as (much like the US) the majorities of several active presbyterates there will enter retirement later this decade as the last large classes ordained in the 1960s and early 1970s "age out" of full ministry. 11am in Ireland, a press conference at this appointment hour was to take place in St Patrick's Cathedral, with Brady and the key force behind the recent moves – the New York-born Nuncio, Archbishop Charlie Brown – on-hand to present the archbishop-elect. A former rector of Rome's Irish College, the Cavan-born Brady was likewise a simple priest on his 1994 appointment as coadjutor to Cardinal Cahal Daly, whom he succeeded 18 months later. Once hailed as "man of patent sincerity" and even a "Moses"-like figure for his work in advancing the Isle's long-fraught peace process, Brady's standing has come under heavy fire and loud calls for his departure amid revelations of his role in the Irish church's long, brutal history of sexual abuse by clergy and religious, and the subsequent neglect of allegations by church officials. 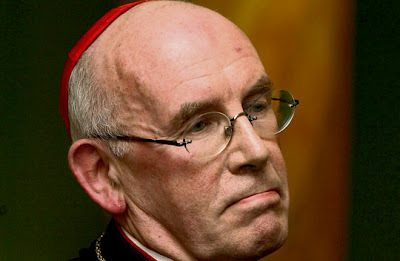 Most prominently, the sitting primate was bitterly excoriated in the open last year after it emerged that, as a priest-notary in the 1970s, he had sworn teenage victims to secrecy – a standard part of a canonical proceeding – in collecting testimonies of their abuse by Fr Brendan Smyth, the Norbertine whose staggering trail of assaults would make him the country's most notorious predator priest. Smyth was convicted on 20 abuse-related counts before his death in prison in 1997, three years after disclosures that his criminal case was intentionally bungled by civil authorities led to the collapse of an Irish government. Brady is believed to have requested a coadjutor in early 2010, following the first round of outcry over his involvement in a case involving the late cleric, who was also found to have abused children in Rhode Island and the Dakotas during a brief period of ministry in the US in the 1960s. Notably, the cardinal's successor already serves on the National Board for Safeguarding Children, established by the Irish bishops in 2006. Despite a fairly sizable record of media turns – including a history of presenting the "Thought for the Day" on the North's BBC stations – the primate-in-waiting is described as a "shy" or "soft spoken" figure, yet perhaps most pointedly of all, a "protege" of the cardinal's. In his statement on today's announcement, Brady said he received the news with "joy and gratitude," describing the choice of his eventual successor as a "gift." Brady turns 75 on 16 August 2014. Underscoring the influence of the post his successor will inherit, the cardinal was scheduled to spend this afternoon in Dublin, joined by a delegation of prelates for "wide ranging talks" with the Taoiseach (Prime Minister) Enda Kenny. According to Irish reports, the sit-down would be the duo's first meeting since Kenny's furious attack on the Holy See in the wake of a 2011 state inquiry that detailed a diocese's serial mishandling of abuse allegations, one of several to have been conducted over the last five years. Meanwhile, as Ireland enters into a charged debate over amending its constitution to legalize abortion – a debate in which accusations of "misogyny" and "impermissible arrogance," to say nothing of the scandals' fallout – have been lobbed at the church's leadership for its defense of the unborn, today's keenest reaction might just be how to resolve the impending confusion that, at least for a time, will see both the country's most prominent prelates called "Archbishop Martin." This one, however, is reportedly not another Diarmuid. Then again, who ever could be? Or as the "cabal" would have it, just one of those is more than enough. We live in a time of great change, challenge and opportunity. It is a time, as the psalms say, to ‘sing a new song to the Lord’. There is need for renewal in the church, so that the message of Christ, in all its richness, is presented in ways which engage a new generation. There is a need for a mature relationship between church and society, in both parts of this island, and people of faith have a vital role to play. It would hugely impoverish our faith if we were expected to ‘leave it at home’ or ‘keep it for Sundays’, excluding it from our conversations and actions in daily life. I believe it would equally impoverish society if the fundamental convictions of faith were unable to be heard in public debate; it would diminish our understanding of the human person and dilute the concept of the common good. In these days of recession and financial crisis, many people are struggling to find work, pay the bills and keep food on the table. And there are other kinds of poverty around us – a poverty of meaning in life, a poverty of purpose, a poverty of hope. Today, more than ever, people of faith are called to present to the world ‘a coherent ethic of life’ – one which knits together a conviction about the sacredness of human life and the dignity of the person, with a commitment to solidarity and the family, to the fair distribution of goods and environmentally sustainable development, to justice and peace. As Christians, we are not there to impose, but to invite; we are not there simply to oppose, but to convince others of the truth of Christ’s teaching and to offer them the gift and message of salvation. We say to everyone in our society, as Blessed Pope John Paul II did: ‘Do not be afraid, the Gospel is not against you, but for you’, or as Pope Benedict XVI put it: ‘if we let Christ into our lives, we lose nothing, absolutely nothing of what makes life free, beautiful and great’. I look forward to getting to know Archbishop Clarke and the other Christian Church leaders. It is important that we encourage dialogue and seek common cause with all groups and individuals who are working for the common good. The continued threats from those who appear not to want lasting peace, and the tensions on our streets in recent days, remind us how important it is to work more closely together for true and lasting reconciliation. There is still much to be done in healing the wounds caused by division and mistrust. We in the Churches can play out part – inspired by the Word of God which speaks clearly to us about conversion, repentance and forgiveness. One of the greatest challenges facing our Church is to acknowledge, live with, and learn from the past, including the terrible trauma caused by abuse. I think today of all those who have been abused by clergy, and the hurt and betrayal they have experienced. As the words on the Healing Stone at the International Eucharistic Congress remind us – they have been left with a lifelong suffering. I am saddened that many good Catholics were let down so badly over the issue of abuse and that some have even stopped practising their faith. It saddens me because I love God and I love the Church that I serve. I believe that faith in Jesus Christ brings meaning and purpose to our lives and gives hope and healing to anyone who feels broken or in despair. While Eamon Martin's own comments spoke of his trepidation at accepting the post, in an even deeper indication of the high-wire that awaits, the editor of the independent Irish Catholic newspaper, Michael Kelly, said in a radio interview this morning that "several people" had declined appointment as the next primate. Talley-Ho – For Atlanta, A New Auxiliary. Again. "Let Us Go Joyfully to Bethlehem"